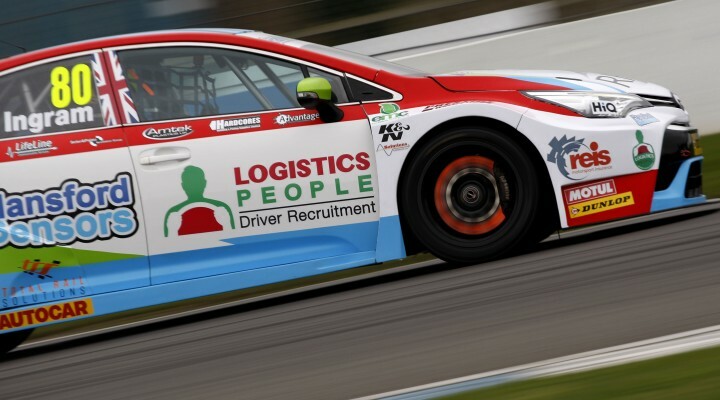 Speedworks Motorsport’s Tom Ingram topped the times in the only official BTCC pre-season test at Donington Park earlier today (16 March). The most successful grid in the series’ history had been confirmed during the Season Launch event at the Leicestershire venue, with an incredible 16 race-winners included among the capacity 32-car line-up. It was Ingram who earned the early bragging rights as he impressively led a Toyota one-two, ahead of Handy Motorsport’s Rob Austin. Ingram’s newly facelifted Avensis set the pace throughout much of the four-hour long session, with Austin also backing up the Toyota’s credentials with his own stellar lap. BTC Norlin Racing – new entrants for 2017 – starred during the test, as Chris Smiley took third in his Chevrolet Cruze, whilst race-winner Adam Morgan was just 0.004s behind in the Mac Tools-backed Mercedes A-Class. Jack Goff claimed fifth for Eurotech Racing ahead of Laser Tools Racing’s Aiden Moffat. Michael Epps was seventh on an impressive afternoon for Autoaid/RCIB Insurance Racing. Series returnee Tom Chilton was the first of the manufacturer drivers on the timesheets, as the all-new Power Maxed Racing Vauxhall Astra ran extremely well on its first official outing. Dave Newsham made it two BTC Norlin Chevrolets in the top ten as he pipped Ollie Jackson’s AmD Audi S3 to claim ninth. A number of the big guns failed to show their true pace with champion drivers Gordon Shedden, Colin Turkington, Matt Neal, Jason Plato and Andrew Jordan all finishing down the order. The hugely competitive field was able to provide a sign of things to come with some 18 drivers separated by less than a second. Thirty cars completed laps during the session, with more than 1,200 laps clocked throughout the field. Two of the five young rookies on the 2017 grid – Luke Davenport and Will Burns – endured trips into the gravel on the day but both drivers gained valuable experience ahead of their upcoming BTCC debuts. Final preparations will now be made before the field makes its way to Brands Hatch for the opening rounds of the 2017 Dunlop MSA British Touring Car Championship on 1/2 April.